Chances are you’ll never plumb the depths of the Mariana Trench or explore the ruins of an ancient shipwreck. But you can hold part of geologic history in your hand with these ceramic pieces glazed with various muds collected from the deep sea, courtesy of The Soft Earth Speaks. There’s pottery glazed with mud from the mid-Atlantic Ridge, as well as from a Phoenician shipwreck, circa 8th century B.C., not to mention a green-glazed bowl with the texture of orange peel, courtesy of mud from the Havre Seamount (an underwater volcano off the coast of New Zealand). If you’re looking for the perfect gift for a dinosaur buff, she’s got items glazed with sediment from the K-T boundary layer — evidence of a possible asteroid strike that some paleontologists believe may have wiped out the dinosaurs 65 million years ago. Rarest of all is a small bag of mud harvested from the Mariana Trench — you know, that hydrothermal vent in the Mariana Islands (near Guam) that’s pretty much the deepest place on Earth. It’s so rare that Lederman only uses it for accents, rather than a full glaze. You can see more of Lederman’s work, and snag a few of these ceramic beauties for yourself, at her online store. 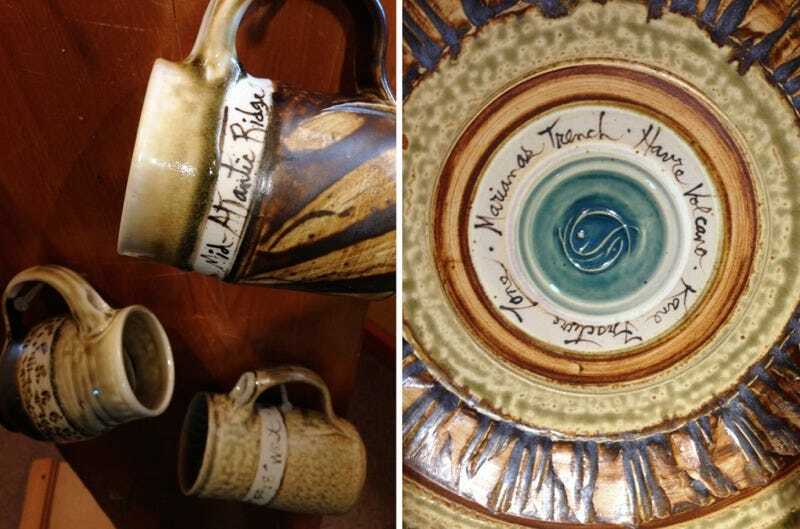 But it’ll cost you: mugs will run you a fairly reasonable $60-$70, but the large plates run anywhere from $250 to $875, depending on the rarity of the mud used in the glaze. Photos via The Soft Earth and Deep Sea News.